The emergence, and subsequent explosion in popularity, of smartphones has led to a new wave of mobile operating systems. In terms of market share, Android is currently leading the pack, followed by iOS, with Windows Phone trailing in third, and BlackBerry just about hanging in there. The question is, which of these mobile operating systems do you think will ultimately win out? Will all of them survive far into the future? Or will a new mobile OS appear over the horizon to challenge the might of Apple, Google, and Microsoft? 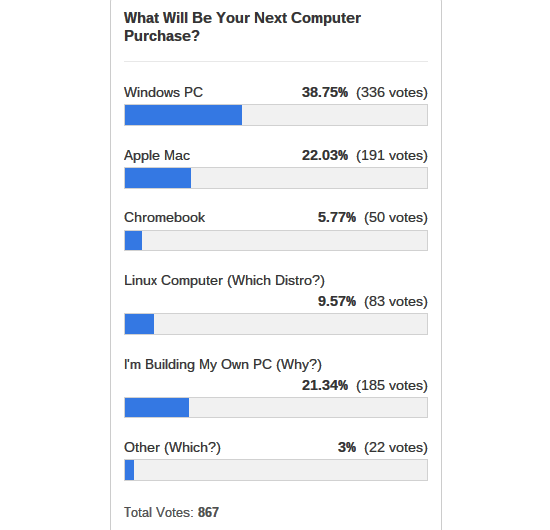 Out of a total of 867 votes, 38.8% chose Windows PC, 22% chose Apple Mac, 5.8% chose Chromebook, 9.6% chose Linux Computer, 21.3% chose I’m Building My Own PC, and 3% chose Other. This is a strong win for Windows, which shouldn’t really come as any great surprise. Despite its continual missteps of late, Microsoft can still rely on plenty of people sticking with Windows; maybe out of habit, maybe out of preference, maybe out of comfort with what they already know. However, almost a quarter of you chose Apple Mac, which suggests we have a higher proportion of Mac users here at MakeUseOf than we should expect. That 22 percent is a lot higher than the 7 percent market share Mac commands overall. No wonder our Mac section is so popular. My ‘next’ purchase is still – I believe – a long way down the road. After a few long months, I made the switch from Windows to Mac last March. Sure, Windows has come a long way since I first started with Win95; it gave us W98 (great), XP and 7… and now W8; but between those, we got a couple of OS which definitely let us all down. I enjoyed W7, I don’t mind the huge paradigm jump in W8, but OSX just felt right from the beginning: smooth, clean, easy to use, easy to install things (free….). Now mix that with a pretty good laptop (i5, 2.4G, 8Gb RAM, 256 SSD, awesome retina display) and you’ve got yourself a great laptop. And then there’s the trackpad… ahh, the trackpad. Sure, it’s expensive when compared to many laptops on the market. Where I’m from, there’s probably 50-100 different options spread out in different stores. But I still haven’t found a single laptop which offers similar specs at a significantly lower price: same ram, same ssd, same battery life. Can anybody help with that? I use Windows at work and I expect that is the case for many, but it’s just a lot more fun to come home and work on my Mac. If personal computers/laptops are still a thing in 5 years – and if for some reason I need to buy a new one – I’m sure I’ll continue with Mac. We chose this comment because it’s an impassioned argument for buying a Mac from someone who has only recently switched away from Windows. As someone who personally finds Macs too expensive to consider, this was an intriguing comment to read. Perhaps I need to start saving up. This week’s poll is all about mobile operating systems, of which there are an increasing number. The main players are currently Android, iOS, Windows Phone, and BlackBerry, but there are others, such as Firefox OS and Tizen, joining the battle. We simply want to know which of these will eventually win the war of the mobile operating systems. It could be argued Android already has done so thanks to its current dominance, but iOS is still the first choice of many people, Windows Phone is growing, and BlackBerry has a small chance of snatching victory from the jaws of defeat. Meaning it’s all still to play for. Remember, this poll isn’t necessarily about which mobile OS you personally prefer, but which you think stands the most chance of knocking out all of the competition. Which Mobile OS Will Ultimately Win Out? Please use the poll above to tell us which mobile operating system you think will win the war, and then take to the comments section below to tell us why you think Android will eventually smash all-comers, or why iOS will push back against the interlopers, etc. Remember, there’s an awesome T-shirt in it for the person responsible for the coveted Comment Of The Week.